Pulmonary embolism (PE) and acute coronary syndromes (ACS) both present with sudden onset chest pain. There is a potential for diagnostic dilemma in view of both having overlapping electrocardiogram (ECG) changes and often, elevated cardiac troponin levels as well. We report an interesting case of a 45-year-old female presenting with sudden onset chest pain and shortness of breath with widespread ST depression in anterior precordial leads. Although the case was referred as ACS for possible coronary revascularization, careful clinical examination, and subsequent investigations revealed submassive PE. Intensivists and cardiologists need to be aware that such a diagnostic dilemma due to an “ischemic-looking” ECG between PE and ACS is not uncommon. Rational clinical decision-making and use of multimodality imaging techniques is helpful in arriving at the correct clinical diagnoses. The patient was a 45-year-old obese female who presented with sudden onset chest pain and shortness of breath for 2 days. She was a nonsmoker and had no previous history of hypertension, diabetes, or coronary artery disease or use of any medications; a 12 lead ECG done outside revealed T-wave inversion in anterior precordial leads [Figure 1] and elevated Troponin T levels (0.33 ng/ml, upper limit of normal 0.01 ng/ml). She was diagnosed as a case of anterior non-ST-elevation myocardial infarction (NSTEMI), treated with aspirin (75 mg), clopidogrel (75 mg), beta blockers, nitrates, and referred to our institution for an urgent coronary angiogram. On presentation at our institution, she was dyspneic, with a respiratory rate 26/min and blood pressure of 110/70 mmHg. Chest and cardiovascular examination was unremarkable, without any evidence of heart failure or pulmonary congestion. A closer look at the ECG revealed that in addition to the anterior precordial ST depression, there was evidence of S1Q3T3 pattern (prominent S wave in the lead I, presence of Q and inverted T wave in the lead III), ST-segment depression in inferior leads and R/S in V6 <1. The mode of presentation and these additional ECG findings led to a presumptive diagnosis of acute PE, and a two-dimensional echocardiography was performed. This revealed dilated right atrium, mildly dilated (right ventricle [RV]) which was hypokinetic with moderately depressed ejection fraction. There was moderate tricuspid regurgitation (TR) and an estimated RV systolic pressure of 90 mmHg [Figure 2]. The left ventricular (LV) function was normal. 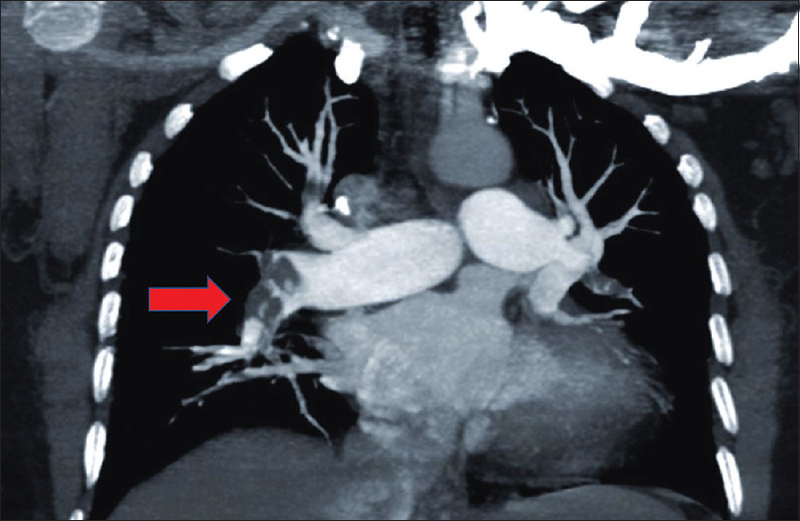 A 64-slice spiral computed tomography (CT) scan was performed which revealed submassive PE and thrombotic obstruction of segmental and subsegmental left and right branch pulmonary arteries, confirming the diagnosis of acute PE [Figure 3]. 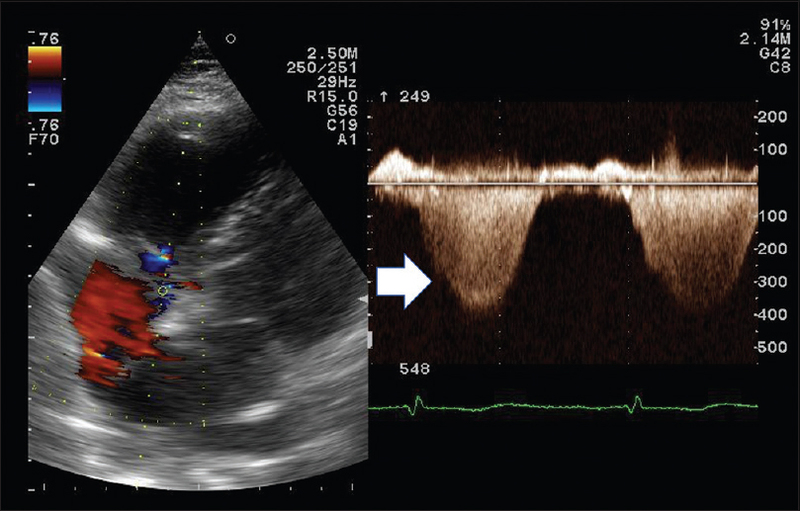 Figure 2: Echocardiography demonstrating tricuspid regurgitation and an estimated RV systolic pressure of approximately 80 mmHg. The patient was immediately thrombolyzed using intravenous urokinase (4400 U/kg bolus) followed by infusion (4400 U/kg/h) for the next 24 h. Serial echocardiographic studies were done over the next 24 h to monitor the RV systolic pressure, which reduced to 30 mmHg (from 90 mmHg), with normalization of RV systolic function and only mild residual TR. A Doppler ultrasound of lower limbs did not reveal any evidence of deep venous thrombosis and tests for protein C/S deficiency and anticardiolipin antibody were negative. Oral anticoagulation with Warfarin 3 mg od was started, with a target INR 0f 2.5, and the patient was discharged after a week. She remains asymptomatic at the least follow-up of 6 months. Acute PE most often presents with sudden onset chest pain or shortness of breath and can be potentially fatal, if not diagnosed and treated in time. This case was initially diagnosed and managed as ACS and subsequently referred to our institution for a coronary angiogram. The ECG pattern of anterior precordial leads' T-wave inversion and elevated troponin levels probably prompted the referral diagnosis of ACS. However, careful analysis of the ECG revealed that though there were ST depression and T inversion in anterior precordial leads (suggesting anterior NSTEMI), there were other clues to an alternative diagnosis, namely PE. These ECG signs included the presence of the S1Q3T3 pattern, rightward axis (+90) and S waves in V6 suggestive of the right ventricular overload; the anterior precordial T inversions were, in fact, a manifestation of acute right ventricular strain. The S1Q3T3 pattern was first described by McGinn and White in 1935. They gave a voltage criteria denoting PE-induced acute cor pulmonale: S wave in lead I, Q wave in lead III, amplitude of more than 0.15 mV, and associated T-wave inversion in lead III. The incidence of S1Q3T3 pattern for acute PE is nonspecific and is reported to range from 12% to 50%. This pattern has been found to be present in conditions other than PE as well. Ischemic looking ST changes in anterior precordial leads including ST-segment depression, and more rarely ST-segment elevation have also been reported in PE, mimicking the changes in ACS.,, Most such “ischemic looking” ECG abnormalities associated with PE are thought to be due to a sudden pressure load on the RV, producing myocardial ischemia, epicardial or microvascular coronary vasospasm, or hypoxemia-induced catecholamine surge. Although cardiac troponins are sensitive and specific markers of myocardial injury, levels can be elevated in PE too, further causing a diagnostic dilemma with ACS., Elevated troponin levels in cases of PE are postulated to occur consequent to a sudden rise in RV pressure and ventricular ischemia and are an increased predictor of mortality. Despite the initial management of ACS and PE being similar (treatment with heparin or thrombolysis), a diagnosis of PE would considerably change the long-term management since patients with PE would necessitate a detailed workup for coagulopathy and long-term oral anticoagulation. It is important to remember that an orderly clinical approach is a requisite in all cases, and use of multimodality imaging (including echocardiography and CT imaging) is often very helpful in arriving at the correct diagnosis. Such an approach may obviate occasionally unnecessary investigations (like a coronary angiogram); in cases of acute PE mimicking ACS, a diagnostic coronary angiogram has revealed normal coronary anatomy despite the presenting ECG showing anterior ST-segment elevation. Intensivists and cardiologists need to be aware of the fact that PE can often present with ECG signs suggestive of myocardial ischemia as well as elevated troponin levels. PE should always be considered in the differential diagnosis of patients presenting with chest pain or dyspnea, “ischemic-looking ECG” and elevated troponin levels. Intensivists and cardiologists need to be aware that such a diagnostic dilemma due to an “ischemic-looking” ECG between PE and ACS is not uncommon. Knilans TK. 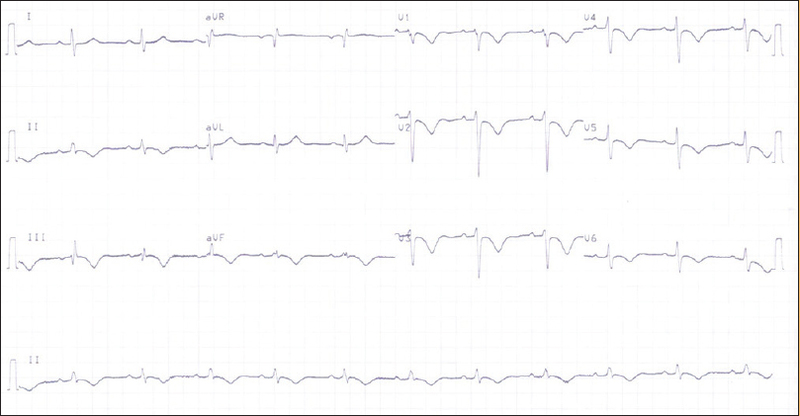 Myocardial infarction and electrocardiographic patterns simulating myocardial infarction. In: Chou T, Knilans TK, editors. Electrocardiography in Clinical Practice: Adult and Pediatric. 4th ed. Philadelphia, Pa: W.B. Saunders Company; 1996. p. 167-70. Chou T. Electrocardiography in Clinical Practice. 2nd ed. Orlando: Grune Straton; 1986. p. 309-17. Ullman E, Brady WJ, Perron AD, Chan T, Mattu A. Electrocardiographic manifestations of pulmonary embolism. Am J Emerg Med 2001;19:514-9. Livaditis IG, Paraschos M, Dimopoulos K. Massive pulmonary embolism with ST elevation in leads V1-V3 and successful thrombolysis with tenecteplase. Heart 2004;90:e41. Falterman TJ, Martinez JA, Daberkow D, Weiss LD. Pulmonary embolism with ST segment elevation in leads V1 to V4: Case report and review of the literature regarding electrocardiographic changes in acute pulmonary embolism. J Emerg Med 2001;21:255-61. Wilson GT, Schaller FA. Pulmonary embolism mimicking anteroseptal acute myocardial infarction. J Am Osteopath Assoc 2008;108:344-9. Giannitsis E, Müller-Bardorff M, Kurowski V, Weidtmann B, Wiegand U, Kampmann M, et al. Independent prognostic value of cardiac troponin T in patients with confirmed pulmonary embolism. Circulation 2000;102:211-7. Douketis JD, Crowther MA, Stanton EB, Ginsberg JS. Elevated cardiac troponin levels in patients with submassive pulmonary embolism. Arch Intern Med 2002;162:79-81.